Good morning to you all my wonderful people. it's a brand new and wonderful day. how is your love life? hope you're having the time of your life? love is a beautiful thing and it's something that needs to be enjoyed. Another thing to consider among things that bring sweetness and happiness to the relationship between the couple is PRAYER. You might want to ask why prayer? yes, it's a good question. If you've heard the statement that says "family that pray together stay together", I want you to know that this statement is true. Not only that prayer is a way of making a request from the creator, but prayer also helps to overcome challenges. it is very important that the couple pray together. You have to fix it within your daily activities. "When you know how to pray you've known how to win in life". If you want to enjoy your love life with your special one you must learn how to pray together. the prayer doesn't have to be a very long one, a short, sincere and honest prayer of two loving and united hearts could do wonder. Not only does prayer moves a mountain, but prayer also brings joy and peace of mind. YOU HAVE TO PRAY TOGETHER every day because it keeps one in check and in tune with the creator and the right things to be done. A relationship built on prayer breeds a powerful, amazing, happy and loving environment. 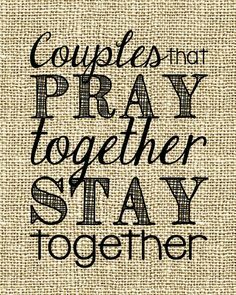 Besides, you have nothing to lose and everything to gain when you pray with your spouse. Prayer is not just the master key to happiness, prayer is also the door that shuts out intruders and darkness of this world that try to wreck happiness between husband and wife. Should you still be doubting and asking why should you pray with your partner, among the advantages and functions of prayer are the under-listed. 1. Prayer gives one the power to overcome temptation. 2. Prayer strengthens the bond between a couple. 3. Prayer helps a couple to communicate their needs with God. 4. Prayer helps one to develop a spirit of humility. 5. Prayer helps the couple to be conscious of living together in the right way. 6. Prayer helps a couple to develop a loving and selfless attitude toward each other. May God help us to learn how to truly pray together with our spouse and enjoy the unlimited joy and true happiness for life in God's name. Amen. PRAYING TOGETHER MAKES LOVE SWEET. PLEASE LET DO THIS WITH OUR PARTNERS. Warning: Don't have a relationship without prayer. Building your relationship on prayer is like building your house on a solid rock, it would still be standing even after you've experienced a raging storm.